The practice of dentistry involves more than clinical procedures. Patients present with a diverse blend of emotions, needs, spirituality, and psychological perspectives that may not be tangible and measurable, but that are a major component in their ability to successfully undergo dental treatment. These factors can combine to influence the patient to seek or to avoid dental treatment. The members of the dental staff also have these components to their personalities, which can influence their interactions with patients and their ability to remain professionally engaged and to maintain optimal mental and physical health throughout their careers. Psychologic and behavioral problems can develop for both patients and members of the dental staff that can interfere with the ability to receive or provide dental treatment. This course will discuss some of the most common behavioral and psychologic issues that confront the patient and members of the dental staff, their potential solutions, coping mechanisms, and the harmful effects of the problems left untreated. This course is designed for all dental professionals in all practice settings. NetCE is designated as an Approved PACE Program Provider by the Academy of General Dentistry. The formal continuing education programs of this program provider are accepted by the AGD for Fellowship/Mastership, and membership maintenance credit. Approval does not imply acceptance by a state or provincial board of dentistry or AGD endorsement. The current term of approval extends from 10/1/2015 to 9/30/2021. Provider ID 217994. AGD Subject Code 153. NetCE is an ADA CERP Recognized Provider. ADA CERP is a service of the American Dental Association to assist dental professionals in identifying quality providers of continuing dental education. ADA CERP does not approve or endorse individual courses or instructors, nor does it imply acceptance of credit hours by boards of dentistry. Concerns or complaints about a CE provider may be directed to the provider or to ADA CERP at www.ada.org/cerp. NetCE is approved as a provider of continuing education by the Florida Board of Dentistry, Provider #50-2405. NetCE is a Registered Provider with the Dental Board of California. Provider Number RP3841. Completion of this course does not constitute authorization for the attendee to perform any services that he or she is not legally authorized to perform based on his or her license or permit type. NetCE is accredited by the International Association for Continuing Education and Training (IACET). NetCE complies with the ANSI/IACET Standard, which is recognized internationally as a standard of excellence in instructional practices. As a result of this accreditation, NetCE is authorized to issue the IACET CEU. NetCE designates this activity for 5 continuing education credits. This course meets the Dental Board of California's requirements for 5 unit(s) of continuing education. Dental Board of California course #05-3841-19207. NetCE is authorized by IACET to offer 0.5 CEU(s) for this program. In dentistry, psychologic and behavioral issues of patients and staff are a critical component in the ability to develop successful relationships and optimize care. The purpose of this course is to provide dental professionals with the information necessary to identify behavioral issues in their patients and themselves and to address these issues appropriately. Identify the characteristics of fear, anxiety, and phobias associated with dental treatment. Outline treatment modalities available for dental patients with anxiety or fear. Distinguish between anorexia nervosa and bulimia nervosa and describe the effects of each upon oral health. Discuss the basic concept of stress and its physiologic manifestations. Identify the ramifications of unresolved stress for patients and dental staff. Dental appointments can involve a variety of treatments, including manipulation of inflamed gingival tissues, restoration of teeth with carious lesions, extractions, and the creation of prostheses. Each of the techniques involved in these treatments provides observable and measurable results. However, beyond these readily apparent manifestations of dentistry are the equally important considerations of the behavioral and psychologic issues that can affect patients and staff. These are issues that are not easily quantified, yet their manifestations can have profound effects on patient health and satisfaction. This course will examine patient anxiety and fear, which can be of such magnitude that dental treatment is avoided until an odontogenic emergency arises. Treatment protocols to address these issues will be reviewed. Anorexia nervosa and bulimia nervosa will be discussed as psychologic issues with direct adverse effects upon the oral mucosa and the teeth. Patient behavior and motivation related to obtaining dental care and to maintaining ideal oral health will be examined. Finally, the most common causes of stress for both patients and staff, the biologic response to stress, the problems that occur when stress is unresolved, and stress management techniques will be highlighted. Understanding the behavioral and psychologic issues that confront patients and the dental staff is an essential component in providing excellent comprehensive patient care. Few people look forward to a visit to their dentist, but most patients do not have anxiety or fear of such magnitude that it interferes with the completion of dental treatment. Despite advances in procedures, the administration and potency of local anesthetics, and the availability of anxiolytic medications, some patients have such high anxiety about dental treatment that they only seek dental treatment in the most dire of emergency circumstances. Unfortunately, these patients usually present for treatment with extensive pain and/or swelling, which amplifies their dental anxiety and can leave them with limited and expensive treatment options. Ironically, most problems that evolve to dental emergencies could be prevented or treated at an earlier stage with regular prophylactic appointments. It is difficult to estimate the prevalence of dental anxiety and dental phobia. These conditions are distinct from fear, which is defined as a feeling associated with a more immediate and real stressor, such as immediately prior to an injection of a local anesthetic. Anxiety, on the other hand, is a state in which an individual experiences a vague, generalized feeling of powerlessness and inability to cope with a real or imaginary stressor. This can lead to physical signs, such as sweating, trembling, and rapid breathing, and can culminate in a panic attack. A patient who has a dental appointment in the future may dwell upon this well in advance of the appointment date. Patients may imagine an exaggerated length or gauge of an anesthetic needle, be resigned that there will be intense pain upon the injection, or be unduly concerned that an untoward systemic reaction will occur upon injection of a local anesthetic. These are patients for whom anxiolytic medications and protocol are beneficial. For patients with anxiety about untoward events, preparing them for the possibility of short-term systemic effects (e.g., transient tachycardia) as a result of the inclusion of the vasoconstrictor epinephrine may help ease fears and prevent a panic attack. When severe anxiety is concentrated upon a singular concern, such as dental treatment, out of proportion with the real risks and dangers involved, this is called a phobic disorder or a phobia . Patients with a dental phobia are aware that their fears may be irrational, but they lack the ability to change their reaction. These patients often exhibit classic avoidance behavior and will go to extremes to avoid dental appointments. Insomnia before dental appointments and an intense state of nervousness that increases as the appointment date draws near (especially while the patient is waiting in the reception area) can occur . These difficulties often prompt patients to skip or cancel appointments, which can result in progressive dental deterioration. Patients with concomitant psychologic problems, such as agoraphobia, behavior disorders, social phobias, and substance abuse problems, are more prone to a higher magnitude of dental anxiety that can evolve into dental phobia . These patients generally require oral anxiolytic medications and possibly supplemental nitrous oxide oxygen inhalation for most dental treatment. Intramuscular or intravenous agents that produce deeper sedation or even general anesthesia may be required for surgical procedures or for more complex dental treatment. Clinicians and those who administer these medications must be prepared to treat adverse drug reactions, including allergic reactions, excessive respiratory depression, and cardiac arrest. Educational and preparatory requirements for the use of these medications vary by state. Any medication administered must be compatible with the patient's medical history. The origin of fear, anxiety, and phobia as they apply to dental treatment are as variable as the patients in whom these problems occur. The degree of affliction and the source(s) of the psychologic issues may improve or become worse over time. A patient who is anxious about an injection of a local anesthetic but feels no or minimal pain during its administration may be less anxious about this procedure at subsequent visits. If the same patient perceives the injection to be painful or if epinephrine-induced tachycardia occurs, a progression from fear of injections to a state of anxiety or phobia could develop. A traumatic dental event is not considered the only cause of appointment anxiety. Some patients who are fearful, anxious, or phobic about dental treatment have never had a traumatic dental experience, and other dental patients who have endured unpleasant dental experiences do not develop phobias. An initial examination as to the origins of the anxiety should consider if any actual objective experience (e.g., a traumatic dental event) occurred and is the source of these problems, but it is important to remember that it is not the only cause of such behaviors. Cognition and perception, consciously or subconsciously, are the mental processes through which a traumatic dental event (real or anticipated) becomes a psychologic and behavioral concern. A three-part model has been established to define the primary sources of dental fear. This model posits that patients are fearful of dental treatment because they have had a negative dental experience themselves, have heard accounts from other people who have had an unsatisfactory or painful dental experience, or have witnessed a traumatic event . However anxiety or phobia develops, these patients usually share one or more of these common concerns, which initiates and maintains the reaction. Beyond previous traumatic experiences in a dental or medical setting (experienced or vicarious), there are several other issues that can challenge the psychologic and emotional reserves of dental patients. Some are visual or auditory in nature, such as the sight of an anesthetic syringe or the sound of a high-speed hand piece, while others are less tangible. Some patients associate a reclined position in the dental chair with a feeling of vulnerability and loss of control over their immediate environment. These feelings can be heightened for those who are claustrophobic, as the positions of the dentist, dental assistant, and/or dental hygienist can leave a minimum of personal space in a generally small room. Patients may be concerned that they will be unable to communicate pain or suffocation due to anesthesia of oral tissues (especially the tongue) or the presence of fingers and/or dental instruments (e.g., cotton rolls, rubber dams, or aerosols of water from high-speed hand pieces) in their mouth. The mouth has a significant neural supply and is highly sensitive, which makes fear of pain common, but there is an emotional component as well. The mouth is a private area of the body, and entrance into it, even for legitimate purposes such as dental treatment, may be considered a violation of privacy by some patients. Patients with respiratory conditions (e.g., asthma, emphysema) may have concerns about the ability to breathe and maintain a patent airway during dental procedures, especially while in a supine position. The stress of this anxiety may be enough to precipitate an asthma attack in susceptible individuals. Other physiologic concerns, such as a heightened gag reflex, can cause anxiety as well. For patients who are anxious regarding vomiting, any procedure in which a high-speed hand piece or ultrasonic scaler creates an aerosol may be particularly frightening. During impression procedures, the materials used can flow back toward the pharynx and must remain in the mouth for several minutes while the material sets, resulting in a risk of vomiting or choking. Stroke patients with damage to the neural supply of the tongue, pharynx, and oral musculature may approach dental appointments with fear or anxiety if their ability to open or close their mouth, swallow, or move their tongue has been compromised. This is not an exhaustive list of all the possible sources of fear, anxiety, or phobias related to dental treatment; however, the most common have been highlighted. While these stressors are listed individually, patients may experience several together, with the significance of each stressor varying by patient. The anxiety, fear, and phobias that affect dental patients can be considered significant sources of stress. These patients may have issues that have caused chronic stress, which can exacerbate to acute stress during dental appointments. As discussed, two of most common dental appointment-related stressors are the sight of anesthetic needles or injection itself and the sight and sound of a high-speed hand piece. Simple techniques, such as keeping the anesthetic syringe from view, the use of topical anesthetics before injections, manual vibration of the tissue that is to be anesthetized, and a proficient injection technique, can contribute to the patient's ability to undergo injection procedures successfully. Because high-speed hand pieces are used for longer periods than anesthetic needles and the sounds cannot be avoided, different techniques must be employed to allay patients' concerns. Portable listening devices with head phones may be useful to mask the sounds of the high-speed hand piece. The hand piece that produces the least amount of sound should be selected. Proper maintenance and the use of new burs for each procedure increase operator efficiency and decrease length of the procedure. Beyond the realm of instruments, time spent waiting in the reception area or in an operatory can be a significant stressor for patients who are anxious or fearful about dental treatment. Effective practice management techniques should be used to minimize the waiting time for patients. When patients are seated in the dental operatory, the dentist and assistant should begin treatment promptly rather than leaving the patient waiting alone. This initial time spent directly with the patient can do much to allay fears about dental treatment. The initial patient meeting should also feature a dialogue to identify any issues relative to dental treatment that the patient considers stressful. Some will require sedation or anxiolytic techniques. As with any other emotion, fear and anxiety can be expressed in different ways. Many patients will do their best to conceal dental anxiety, if possible. However, there are a few common signs that may indicate to clinicians that a patient is struggling with appointment-related anxiety or stress. Verbal signs of anxiety can range from excessive verbosity to near silence. Patients may relate stories about previous traumatic dental events, such as difficulty achieving anesthesia or significant post-procedural pain. The sight of an anesthetic needle or the sound of a high-speed drill may make some uncomfortable. Anxious patients may express a passionate dislike for dentists or make disparaging remarks about previous dentists. Nonverbal signs vary among dental patients and may be more demonstrative of fear and anxiety than verbal signs. A generalized rigidity of posture reflects underlying tension. Crossing the arms, gripping the armrests of the chair tightly ("white-knuckled"), avoiding eye contact, tensing muscles (especially in the facial region), being uncooperative with basic instructions, and fidgeting during a procedure are common physical manifestations of dental anxiety. Uncontrollable physical signs can include an increased pulse, pallor, sweating, and rapid breathing. Irregular, rapid breathing can cause hyperventilation in some patients, with accompanying lightheadedness and loss of consciousness. The ability to recognize and address the issues that cause fear, anxiety, and phobias among dental patients is an important first step in improving patients' experiences. The method(s) by which the anxiety is treated must be individualized in order to be effective. Compassion and empathy toward the patient is an essential component in establishing a foundation of trust, and even just applying these basic principles can begin to decrease fear and anxiety. The initial meeting with the patient provides an excellent opportunity to discuss the aspects of dental treatment the patient perceives as stressful and the degree to which anxious/phobic reactions occur. They can then be addressed using behavior modification techniques, pharmacotherapy, or a combination of both. As always, techniques that are successful for one patient may be unsuccessful for another. Basic behavioral techniques to reduce anxiety include positive reinforcement and the tell-show-do technique. Positive reinforcement involves complimenting the patient for his or her cooperation during dental procedures, encouraging maintenance of this demeanor, and instilling within the patient a sense of empowerment over the stressors that cause fear and anxiety during dental appointments. The tell-show-do technique was initially developed for the treatment of pediatric patients; however, it can be used successfully for the treatment of fearful and anxious adult dental patients as well. The first step is to provide a verbal explanation of the proposed dental treatment in terms the patient can understand. Technical dental terms beyond the patient's comprehension will only serve to alienate the patient and perpetuate the fear and anxiety. The second step is to use a video or model to demonstrate the scheduled dental treatment. Clinicians should pause after each step to allow the patient ample opportunity to ask questions before proceeding. The final step is to perform the actual procedure . Advanced behavioral treatments include relaxation techniques such as diaphragmatic breathing and progressive muscle relaxation . Diaphragmatic breathing (also known as stomach breathing) is similar to the breathing pattern of a newborn child; adults tend to use more rapid and shallow chest breathing, which can disrupt the balance of oxygen and carbon dioxide that is conducive to a relaxed state. As a relaxation technique, diaphragmatic breathing consists of the patient placing one hand on his/her chest, and the other hand on the stomach. The patient then breathes in slowly through the nose so the stomach moves out against his/her hand while keeping the hand on the chest as still as possible. The patient then exhales by tightening the abdominal muscles and breathing out through pursed lips, being careful to keep the chest still . Progressive muscle relaxation consists of the conscious tensing and subsequent relaxing of a specific group of muscles. This practice can involve all of the major muscle groups and is designed to create an awareness of the different feelings associated with muscles that are tensed and those that are relaxed. Fear, anxiety, or phobia about dental treatment often induces muscular tension, and the emotional reactions can be decreased when the patient makes a conscious effort to relax the muscles . Other miscellaneous behavior modification techniques can offer further benefits. Systematic desensitization techniques feature a gradual exposure to the stressor that causes the patient to be fearful or anxious about dental treatment; it is usually attempted in combination with other relaxation techniques . Distraction using music or television, allowing the patient to choose the program or background music, can also serve to shift the patient's focus away from the dental procedure. A further consideration involves the dental professional's degree of proficiency in the procedures being carried out. For example, a dentist who has limited experience in oral surgery should not be attempting difficult extractions (e.g., impacted wisdom teeth) on any patient, but especially not those patients prone to psychologic issues and dental anxiety. Behavioral techniques can do much to minimize the fear, anxiety, and phobia experienced by some dental patients, but it may not always be enough. When these techniques are not fully successful, pharmacotherapy may be a necessary adjunct. Patients who cannot be managed successfully with behavior modification alone usually require anxiolytic medication(s) to address their fears, anxieties, or phobias. It is imperative that any anxiolytic agent used is compatible with the patient's medical history and does not interact with any other concurrent medication. As noted, state laws vary as to the level of training required to dispense these medications, especially when there is a combination of two anxiolytic modalities, such as an oral medication and nitrous oxide/oxygen inhalation sedation. Deeper levels of sedation require a commensurate higher level of training and proficiency in dealing with sedation-related medical emergencies, such as allergic response, respiratory depression, and even cardiac arrest. Consultation with the patient's physician is advisable if the patient has any medical issue(s) that could adversely affect the distribution, metabolism, or excretion of any anxiolytic agent. It is also important to determine if any concurrently prescribed or over-the-counter medication could be the potential source of an adverse drug reaction. Among the many available anxiolytic medications, the benzodiazepines are most frequently used in the dental setting, with diazepam among the most popular. Diazepam is listed as a core medication on the World Health Organization's Model List of Essential Medicines for anxiety disorders . Diazepam has anxiolytic, sedative, skeletal muscle relaxant, amnestic, and hypnotic properties, which make it a useful adjunct for the treatment of the anxious or fearful dental patient . It has a rapid onset of action and more than 90% bioavailability after oral administration. Peak plasma levels occur within 15 to 150 minutes after oral administration . It is available in 2-mg, 5-mg, and 10-mg tablets. When diazepam is used for anxiolytic purposes related to dental treatment, one tablet can be administered the evening before treatment and the second tablet administered one hour before the appointment. The use of diazepam the evening before an appointment can decrease the patient's anxiety and induce deeper and more restful sleep. Dosing will depend on the patient's medical history, weight, degree of anxiety, and the concurrent use of other medications. As with the use of any medication, there are precautions and considerations when diazepam is used, even for the short-term relief of anxiety. Patients should be counseled to refrain from alcohol, other sedative agents, and narcotic analgesics while using diazepam, as these combinations can potentiate respiratory depression. Many medications can prolong the effect of diazepam by decreasing the rate at which it is eliminated systemically, including antifungal medications (e.g., ketoconazole, itraconazole) and the macrolide antibiotic erythromycin . The half-life of oral diazepam can range from 40 to 48 hours in adults, and its metabolism produces an active metabolite known as desmethyldiazepam, which has a half-life of 100 hours . The half-lives of each of these substances are prolonged in the elderly and those with impaired hepatic function. Because the half-life and subsequent sedative effect can vary, patients should refrain from driving or being in any situation in which sedation or drowsiness could place themselves or others in danger. Patients who have used diazepam for anxiolytic purposes should have a responsible adult drive them to and from the dental appointment. Diazepam has been assigned pregnancy category D by the U.S. Food and Drug Administration, so its use is contraindicated in pregnant patients or those who are breastfeeding. Diazepam is excreted in human milk, and nursing infants can become sedated and lethargic. The American Academy of Pediatrics considers the effects of diazepam upon nursing infants unknown, but of possible concern . When a benzodiazepine or any other sedative medication is used as anxiolytic premedication prior to dental treatment, informed consent should be obtained first. The sedative effects of these medications can preclude the ability of the patient to understand the risks and benefits of the procedure. Triazolam is another benzodiazepine with anxiolytic, amnesic, sedative, and muscle relaxant qualities. Triazolam is approved for the treatment of insomnia, and its use as dental preprocedure oral sedation is off-label . Unlike diazepam, triazolam does not generate active metabolites, so its half-life ranges from 1.5 to 5.5 hours . When used to treat dental anxiety, a dose of 0.125–0.25 mg is taken the evening before and 0.125–0.25 mg is taken one hour before the appointment. It has a rapid onset of action (15 to 30 minutes), with a time to peak less than two hours and a duration of action of six to seven hours . The short half-life of triazolam drastically reduces the duration of sedation as compared to the prolonged sedative effect of diazepam. However, patients still must have a responsible adult drive them to and from the appointment. Ketoconazole, itraconazole, and erythromycin are among the many medications that should not be used concurrently with triazolam, as they decrease its systemic elimination with a resultant increase in the blood plasma concentration with a potential for acute toxicity . Triazolam is considered pregnancy category X, and its use is absolutely contraindicated for pregnant and breastfeeding patients. Alcohol, other sedative medications, and narcotic analgesics can potentiate the sedative effects of triazolam and can lead to respiratory depression. Patients should refrain from taking these medications when they use triazolam before dental treatment. With a half-life of between 12 to 18 hours in adults, the sedative, anxiolytic, and amnestic effects of lorazepam, another benzodiazepine, are intermediate compared to diazepam and triazolam [13,19]. The dental dosage can range from 1 mg to 10 mg per day in two to three divided doses, and is dependent on the patient's medical history, weight, and simultaneous use of any other medications. It has a bioavailability of 90% after oral administration, and it is metabolized into pharmacologically inactive metabolites . The peak effects of lorazepam occur approximately two hours after oral administration, so its use as a pretreatment anxiolytic medication should be timed accordingly . The usual dose for preprocedural anxiety is 1–2 mg one hour before the procedure. The sedative effects of lorazepam will linger for several hours after the peak serum levels have been attained, so a responsible adult must transport this patient to and from the appointment. Patients with alcohol dependency problems should not use this medication, as the combination of alcohol and lorazepam can lead to fatal respiratory depression. The simultaneous use of other sedative medications or narcotic analgesics with lorazepam can also cause respiratory depression. Lorazepam is assigned pregnancy category D, and its use should be avoided in pregnant or breastfeeding patients. Also known as "laughing gas" or "sweet air," nitrous oxide/oxygen inhalation has been available for decades as an adjunctive treatment of fearful, anxious, or phobic dental patients. It has sedative, anxiolytic, and mild analgesic properties, although the exact pharmacologic mechanism by which nitrous oxide acts is not completely understood. Its anxiolytic action is believed to be due to binding at select gamma-aminobutyric acid (GABA) receptors, an action similar to the benzodiazepines . The mild analgesic effect of nitrous oxide appears to be linked to the endogenous opioid receptor system, as experimental studies have shown that the introduction of opioid receptor antagonists to the brain decrease the analgesic efficacy of nitrous oxide . The route of administration is inhalation via a mask secured to the patient's nose. The concentration of nitrous oxide for dental sedation and analgesia should be 25% to 50% nitrous oxide with oxygen . . Onset of action can occur in as quickly as 30 seconds, with the peak effects seen in five minutes or less. Unlike the benzodiazepine medications, nitrous oxide is not metabolized in the body. It is eliminated via respiration within minutes after 100% oxygen is inhaled at the conclusion of the dental procedure . According to the American Academy of Pediatric Dentistry, due to the increased risk of pregnancy loss, use of nitrous oxide may be contraindicated in the first trimester of pregnancy. Nitrous oxide is generally well tolerated; however, some patients may experience nausea, vomiting, or central nervous system depression. Absolute contraindications to the use of nitrous oxide include emphysema, pneumothorax, recent middle ear surgery, and the presence of an air embolus. Relative contraindications include pulmonary hypertension, first-trimester pregnancy, and a high risk of nausea or vomiting . Long-term exposure to nitrous oxide can lead to neurotoxicity, female infertility, numbness, and decreased mental acuity. These issues are of more concern to the dental staff, who may regularly inhale trace amounts of nitrous oxide as it is exhaled. The appropriate use of scavenger systems can drastically reduce this occurrence. During procedures, patients should restrict speaking to that which is germane to the dental procedure. State regulations vary as to the degree of training required for dentists using nitrous oxide. The use of nitrous oxide and oxygen sedation alone may be insufficient to provide anxiolysis for patients whose fear, anxiety, or phobia related to dental treatment is excessive. The combined use of nitrous oxide and oxygen inhalation with an orally administered benzodiazepine may provide the increased level of anxiolysis required for the treatment of these patients. The analgesic and anxiolytic effects of nitrous oxide are short, so a combination of nitrous oxide and a benzodiazepine is often given to enhance the analgesic and anxiolytic actions. The dose of nitrous oxide/oxygen and the benzodiazepine depends on the patient's medical history, physical parameters, and level of anxiety and the duration of the procedure. Because this is a dual means of sedation, vital signs should be monitored throughout the procedure. Measurement of systemic oxygen saturation via pulse oximetry is advised as well. Some states will require all members of the dental staff in offices that provide this service to be certified in advanced cardiopulmonary resuscitation. The combination of nitrous oxide and a benzodiazepine can produce varying levels of sedation (i.e., light, moderate, or deep) depending on the dose and clearance and can even ultimately produce a state of general anesthesia. Lightly sedated patients have a minimally depressed level of consciousness, can independently and continuously maintain their airway, and will respond in a normal fashion to verbal commands and tactile stimulation. Patients who are moderately sedated need more tactile stimulation or a higher level of verbal stimulation to respond but can still maintain a patent airway on their own. Finally, deep sedation is a state in which patients cannot easily be aroused and may begin to experience difficulty independently maintaining a patent airway . Clinicians should only sedate dental patients to a degree in which airway maintenance is not compromised. If sedation produces an airway that is not patent, the clinician must be able to re-establish airway patency and provide immediate emergency care. Again, it is vital to consider one's level of expertise in the principles of sedation and ability to respond to respiratory compromise and cardiovascular collapse before attempting to administer sedation. General anesthesia is an option for the phobic dental patient for whom the aforementioned sedation techniques are not able to alleviate their extreme fear of dental treatment. This is a degree of sedation that requires specialized training (e.g., an oral surgery residency) and may need to be performed in a hospital setting. It is the most expensive treatment protocol, but it may be the only option for dental patients with extreme phobias. The exact etiology of eating disorders is unknown, but a combination of genetic, hormonal, societal, cultural, and attitudinal factors are believed to be involved. Images in mass media that promote a thin body as a vehicle to success and happiness have been implicated in altering a person's perception of his or her appearance . Patients with anorexia nervosa have an extreme obsession with their body weight and the restriction of food intake. Women comprise 90% to 95% of anorexia cases, and it is estimated that 1% of all women suffer from anorexia in their lifetime, with the onset usually occurring during the adolescent years [22,28]. Anorexic patients often view themselves as overweight even though most are 15% or more below ideal weight. Women who are anorexic often have irregular menstrual cycles. The skin can become dry and thin and at greater risk for traumatic injury. The restriction of caloric intake can stunt the physical and mental development of children and adolescents, and cognitive damage is possible in all patients. Problems with the cardiovascular system, including hypotension, bradycardia, and cardiac arrhythmias, are very common. Self-induced vomiting and use of laxatives can cause a severe disturbance in the body's mineral and electrolyte balance, and a drastic reduction of the minerals potassium, sodium, and calcium can interfere with the conduction of nerve impulses and the contraction of smooth, skeletal, and cardiac muscle. Failure of multiple organs and systems can lead to death. As part of the disease process, repeated episodes of self-induced vomiting can cause ulceration of the esophageal lining, with the subsequent development of esophageal varicosities and bleeding. Oral effects are generally limited to those caused by extreme starvation and malnutrition. Patients with bulimia nervosa tend to lack the emaciated appearance of patients with anorexia nervosa; their body weight and appearance often appear normal. Bulimia nervosa features recurrent binge eating, in which a large quantity of food is consumed in a short time, followed by purging (e.g., self-induced vomiting, use of diuretics, laxatives, or enemas) to compensate for the excessive overeating. During binging episodes, the bulimic patient experiences a loss of control over the quantity and variety of food consumed . The practice of binge eating and purging must continue at least twice a week for three months for a diagnosis of bulimia nervosa to be made . The teeth and the oral mucosa of bulimic patients can undergo damage as the recurrent regurgitation of highly acidic gastric contents can induce pathologic change in both. In addition, the mucosa of the soft palate and the anterior pharyngeal area can be traumatized when fingers or objects are inserted to induce vomiting. Healing of these areas may be prolonged by the physical and chemical assault associated with this repetitious behavior. Ulcerated areas of the oral mucosa may lead to local or regional oral infections. The virulence of infections can be exacerbated when the altered nutritional status of these patients compromises their immune response. Enamel is the hardest substance in the human body, but the repeated exposure to the hydrochloric acid in regurgitated gastric contents over an extended period of time can lead to a unique pattern of enamel erosion called perimylolysis (Image 1). Perimylolysis features the loss of enamel on the lingual, occlusal, and incisal surfaces of the teeth. 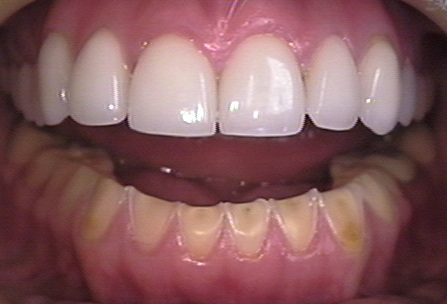 As opposed to attrition, which is the loss of enamel from repetitive tooth-to-tooth contact or abrasion via an external source (e.g., excessive or overly forceful tooth brushing), the gradual dissolution of the enamel matrix in patients with bulimia nervosa leaves a glossy, smooth surface, most commonly on the lingual surfaces of the maxillary anterior teeth . Any lost enamel cannot be regenerated. The underlying matrix of dentin is then exposed; it will wear faster than enamel and is more prone to caries. While enamel is devoid of any neural element, dentin contains dentinal tubules whose odontoblastic processes can perceive thermal stimuli as a source of pain. This can cause patients to neglect oral hygiene and increase the risk of caries and periodontal disease. The irreversible loss of enamel will also cause a change in the occlusion, decreasing the vertical dimension of occlusion. The loss of tooth structure requires that more complicated and expensive restorative options, such as crowns, be utilized. The loss of enamel support around composite or amalgam restorations can lead to their weakening and ultimate loss. The amount of time necessary for the enamel to be eroded in such fashion can range from six months to two years . Erosion on the mandibular teeth caused by bulimia, compared to the restored maxillary teeth. Some eating disorder patients will be treated with antidepressant medications, which can decrease salivary flow and result in xerostomia. The reduction of salivary flow and its lubricating and self-cleansing action for the teeth increases plaque retention and causes a subsequent increased risk in the development of caries and periodontal disease. The parotid, sublingual, and/or submandibular glands of bulimic patients can experience a unilateral or bilateral enlargement during the progression of the disease, often referred to as "chipmunk facies." The exact etiology of enlargement in the glandular secreting elements (acini) is unknown, although various hypotheses include increased likelihood of infection, increased oral flora, hypersecretion, duct obstruction, or extended trauma. In chronic cases, the hypertrophy is irreversible . The treatment of patients with eating disorders involves physicians, nutritionists, psychologists, and mental health counselors. The acknowledgement of an eating disorder can be the most difficult obstacle to overcome in the treatment of these patients. Because eating disorders can progress to debilitation and death, dental professionals who suspect that a patient may have a disorder should offer compassionate support and refer the patient for treatment. Dentistry can be a stressful profession, and it is important for members of the dental staff to identify sources of their own acute and chronic stress. This is essential to preserve the physical and mental health of dental professionals and to ensure peak performance in clinical care. The adverse effects of unresolved stress can compromise the ability of clinicians to perform and can cause a decline in one's ability to relate to patients in a compassionate and empathetic manner. A decline in clinical performance and interpersonal skills may make patients anxious about dental treatment, which will only serve to perpetuate a cycle of stress for both the patient and the clinician. As with patients, there is variability among dental professionals as to the factors or situations that are stressors and the emotional and psychologic reactions to stress. However, some common situations are generally considered stressful, including running behind schedule, dealing with patient complaints, maintaining a profitable practice, striving to attain an ideal balance between career and family, dealing with conflicts among staff members, and treating patients who are difficult or anxious . The ability to confront and to resolve these issues may be a source of stress itself, but it must be undertaken successfully to prevent the adverse effects of chronic stress. Consideration should be given to networking with colleagues who have successfully resolved these issues, taking continuing education courses in practice management and patient relations, and/or hiring a practice management consultant who can identify core problematic issues and devise a plan for their resolution. The definition of stress in the behavioral and psychologic sciences cannot be reduced to a simple formula as it can be in the world of dental materials and physics. Stress is the body's reaction to an adverse internal or external stimulus of physical, mental, or emotional origin that disturbs the body's homeostatic mechanisms . Homeostasis is the body's ability to maintain a relatively constant internal environment, and a vast number of stressors can challenge the body's homeostasis. Stress reactions are highly individualized, with the same stimulus inducing a different response among different people. An individual's unique combination of perception and cognitive integration of stimuli will determine if a specific event or situation is recognized as stressful. The human body has the biologic means to instantaneously and automatically respond to an acute life-threatening situation. The stress, or "fight-or-flight," response originates from the sympathetic division of the autonomic nervous system and provides the rapid dissemination of neural and hormonal messengers through which these rapid physiologic changes occur. The physiologic needs of a person at rest are vastly different than those of a person who is confronted with an emergency situation. For individuals who believe they are at risk, there is an increase in heart rate, cardiac output, respiratory rate and depth, and perspiration. Digestion is decreased as blood is diverted to the skeletal muscles and the brain. Glucose is released into the bloodstream to supply the enhanced metabolic needs of the major muscle groups and the brain. This stimulatory effect is induced by the hormones epinephrine, norepinephrine, and cortisol, the effect and secretion of which subsides after the stress-provoking situation is resolved. Epinephrine and norepinephrine are catecholamines produced by the chromaffin cells in the medulla of the adrenal gland. Epinephrine accounts for approximately 80% of catecholamine production, while the remaining 20% is norepinephrine . These hormones are essential components for the stress response and have different effects upon their target tissues. Epinephrine exerts a profound effect upon metabolic activities, the dilation of the bronchioles, and increased perfusion of blood to skeletal and cardiac muscle. The primary metabolic effect of epinephrine is to elevate blood glucose levels to meet the body's increased metabolic demands. This is achieved by the conversion of glycogen stored in the liver and the muscles into glucose and the release of cortisol from the adrenal cortex, which causes a redistribution of glucose to the brain and major muscles . Norepinephrine has a greater influence on peripheral vasoconstriction and blood pressure. Increased constriction of the smooth muscles in blood vessels raises the blood pressure. The secretion of cortisol is regulated by the release of corticotropin-releasing hormone (CRH) from the hypothalamus, which stimulates the release of adrenocorticotropic hormone (ACTH) from the anterior pituitary gland. Cortisol is released from the cortex of the adrenal gland via ACTH stimulation and influences the energy metabolism of most body cells by keeping the blood glucose levels relatively constant. It also assists in the maintenance of blood pressure by stimulating the vasoconstricting actions of both epinephrine and norepinephrine. Epinephrine, norepinephrine, and cortisol each have a basal level of production that is temporarily increased during stressful situations. When the body's physiologic needs are met, the production of these hormones returns to a basal level. The stress response is an evolutionary cascade of biochemical events essential for an individual's survival in emergency circumstances. The response and the increased hormone levels are generally short, as the extended release can have an adverse effect on an individual's health; biochemical events that are life-sustaining during acute stress can be damaging when their increased production is extended during periods of chronic emotional, psychologic, or physical stress. It is essential to understand the biologic role of each of the stress hormones and how their increased and sustained production can have an adverse effect upon systemic health. People who experience extended periods of stress perpetuate the release of epinephrine, norepinephrine, and cortisol beyond the limits of their intended use for the stress response. It is the sustained exposure to these hormones that can adversely affect systemic health. Prolonged elevation of epinephrine and norepinephrine can lead to an elevation in blood pressure. Chronically high epinephrine levels can also lead to an increased production of glucose and hyperglycemia. Chronic stress causes a sustained production of both CRH and ACTH and therefore cortisol. When cortisol levels remain high, adverse multi-systemic effects can occur. Elevated blood glucose and the development of insulin resistance in target cells will lead to hyperglycemia. Cortisol can also increase the lipid levels in the blood (cholesterol), which can have an adverse effect on cardiovascular health . The function of the immune system can also be compromised during periods of chronic stress, likely due to the effects of prolonged cortisol exposure. The production of cellular elements (e.g., lymphocytes, macrophages) is decreased and consequently the response to an antigenic challenge is diminished . Patients may become more prone to the development of infections, and wound healing will be prolonged. As discussed, stress of short duration does not produce the adverse biologic and biochemical effects seen in situations that cause prolonged stress . Short-term stress caused by lower stakes situations, such as meeting a deadline, is called eustress, and these events offer emotional and psychologic closure upon their completion. Chronic stressors, such as maintaining a solvent dental practice, can span months or years and lead to physical, emotional, or psychologic problems, each of which can further exacerbate the effects of chronic stress. People affected by chronic stress may experience emotional exhaustion and depersonalization, both of which are mental/emotional symptoms of burnout . This problem reduces the ability of the affected individual to work at his or her ideal capacity. Other emotional responses to chronic stress include depression, anxiety, insomnia, irritability, and anhedonia. Cognitive signs can include impaired concentration, memory lapses, and negative thinking. Among the numerous physical responses to chronic stress are tension headaches, hypertension, cardiovascular problems, chronic fatigue, and immunosuppression . Coping mechanisms for chronic stress (e.g., compulsive eating, drug and/or alcohol abuse, excessive gambling, withdrawal, extramarital affairs, suicide) can also lead to negative health effects. These self-destructive behaviors are ineffective in addressing the cause of stress and will compound the problem and delay a long-term resolution. Stress management should be tailored to the needs of each individual and address the situations from which the stress response originates. It is usually not possible to eliminate all sources of stress from an individual's life, but many can be decreased or modified. While some issues may be self-resolved, some require professional counseling, to begin the process of resolution. Unfortunately, some individuals may feel a stigma associated with a need for professional assistance. Support from family, friends, and professional colleagues is an essential component of the healing process. Beyond professional counseling, other avenues to be explored include meditation, exercise, deep breathing techniques, yoga, and hobby development. The ultimate goal is to assist individuals to maintain long-term behavioral and emotional principles that empower them to cope in healthy and effective ways with their personal stressor(s) and thus attain the highest quality of life possible. Prochaska and DiClemente's Stages of Change Model has been widely used in smoking cessation as well as dental care. These researchers have identified six stages that people go through as they attempt lifestyle changes. These stages range from precontemplation, during which the patient does not intend to change within the next six months, to maintenance, when healthy behaviors have been practiced for more than six months. For each stage of change, certain interventions on the part of the healthcare provider are recommended. By employing these interventions, the dental professional is able to "meet" the patient within his or her own particular stage of change at a given time . In the precontemplation stage of change, the person is not thinking about changing. Precontemplation represents a time of resistance to change and may be accompanied by denial that there is a problem. During this stage, the patient may actively resist change and avoid responsibility. To the dental professional, this patient may seem defensive and be labeled as "noncompliant." Recommended interventions at this stage include helping the patient identify his or her beliefs, feelings, and attitudes in a nonjudgmental way. This can be done by employing reflective listening and empathy. In order to make the transition to the next stage, precontemplators must choose to accept ownership of the problem. At this stage, objective information should be provided based on caring and concern, rather than to prove the patient wrong about his or her feelings. During the contemplation stage, the patient is less resistant to change, although he or she is still undecided and may be procrastinating. During this time, patients may tentatively seek information as they assess the benefits that the change will bring. Although the prospect of change within the next six months is characteristic, it is common for some patients to remain in this stage for an extended period of time. The role of the healthcare provider at this time is to help increase self-efficacy and to support the patient's efforts in seeking information. Specific interventions include reflective listening, providing empathic feedback, and offering information and resources when appropriate. The third stage of change is preparation. At this time, patients are ready to take action in the next 30 days and may begin to visualize their future selves and prepare for the change. For example, the patient who wants to quit smoking may begin removing cigarettes from the home. Strategies for this stage are to formulate an action plan that includes setting goals and enhancing self-efficacy. The role of the dental professional at this stage is to provide encouragement, help build confidence and manage anxiety. In the action stage, the patient demonstrates a strong commitment to change by modifying his or her behaviors and environment. This is the time when the person actually tries out the new behaviors. Support from others during this time is very important. The role of the dental care provider is to strengthen the patient's commitment to change. Maintenance is the stage in which patients have maintained desired behaviors for more than six months. During this time, it is important to support continued commitment on the part of the patient and to continue to support self-efficacy. Relapse may occur at any stage of change and can result in a return to any of the earlier stages. Relapse should not be viewed as failure but as part of the ongoing process of growth. Recycling is the process of learning from relapse. When relapse has occurred, the healthcare provider should not demonstrate feelings of disappointment. Instead, being sensitive and helping the patient explore the triggers that related to the relapse is important. This will help the individual recycle previously made gains and return to a higher level of self-care. Readiness to change can vary for different behaviors in the same individual. Therefore, each oral hygiene behavior should be addressed individually with relation to stage of change. For example, the patient may be in the maintenance stage with regard to regular toothbrushing, demonstrating full assimilation of this behavior into his or her lifestyle. At the same time, the patient may be in the precontemplation stage with regard to flossing, indicating resistance to adopting regular flossing habits. The issue of motivating dental patients to increase positive behaviors and decrease negative behaviors in order to increase the likelihood of optimal oral and systemic health is a foremost concern for dental professionals. This includes ensuring compliance with appropriate oral hygiene practices at home (e.g., daily flossing), keeping appointments, smoking cessation, maintaining a diet that decreases the risk of caries, following post-procedural instructions, and using any prescribed medications correctly. Unfortunately, dental and dental hygiene schools devote little time to the behavioral and motivational issues; therefore, it is necessary for dental clinicians to pursue post-graduate studies that refine these essential skills. An understanding of the most common theories of patient motivation is necessary, with the realization that oral health problems are diverse and the success of motivational techniques will vary among patients. For example, an adolescent with misaligned and cosmetically displeasing teeth generally needs little motivation to seek orthodontic treatment. However, motivating approximately 75% of the adult population with periodontal disease to consistently use oral hygiene techniques between recall appointments in order to improve their periodontal health can be a daunting challenge . Alone, recall hygiene appointments on a quarterly or semi-annual basis cannot achieve optimal periodontal health if the oral hygiene at home is lacking or inconsistent. Amid a busy schedule, it can be a challenge for a dental hygienist to complete the necessary treatment and also to develop a meaningful dialogue that will motivate the patient to maintain optimal at-home oral hygiene practices. The first step in bridging this gap is an acknowledgement that behavior modification and instructions in oral hygiene are not the same. Oral hygiene instructions may be delivered in a generic fashion without the necessity of the patient demonstrating his or her ability to use the oral hygiene instruments. Behavior modification, on the other hand, is designed to involve the patient in an oral hygiene partnership that begins at the dental office and is continued daily at home. Oral hygiene instruction is provided that is unique to each patient and allows the patient to demonstrate proper brushing and flossing technique. Most clinicians use the advice model of health education as a motivational tool for patients. This model involves advising patients about the severity of their disease and its consequences if left untreated and the benefits if a recommended course of treatment is completed . Using this template, patients with untreated periodontal disease would be advised that the loss of teeth will ensue and that the fabrication of complete dentures will be required. If patients comply with the recommended periodontal treatment plan, the chance to retain their teeth and avoid complete dentures is excellent. However, patients may consider this approach critical and demeaning and ignore it. Dental clinicians often interpret this as an attitude of indifference on the part of the patient and are discouraged from a similar dialogue with other patients. Dental patients may respond more favorably to a recommended course of treatment when reward or goal theory of motivation is used. Reward theory advocates that patients will repeat a behavior or practice that allows them to feel good, referred to as a positive reinforcement. Similarly, patients will avoid behaviors or practices that are to their detriment (negative reinforcement) . Dental professionals who praise patients for using proper brushing and flossing techniques between recall appointments, as evidenced by decreased probing depths and a reduction in the number of points of gingival bleeding, are using positive reinforcement to encourage patients to sustain these practices. However, it is also necessary to address and reassess treatment goals for patients who have been indifferent toward oral hygiene practices at home, as shown by increased pocket depths and more points of gingival bleeding. Negative reinforcement can be used to encourage these patients to discontinue poor practices, as bleeding, inflamed, and painful gingival tissues are detrimental to systemic and oral health. Goal theory states that setting a goal stimulates a person to pursue definitive action in an effort to achieve the objective . For example, a patient with periodontal pockets in the 3–5 mm range who wants to avoid periodontal surgery will be meticulous in his/her oral hygiene at home and will attend all scheduled recall appointments in order to nonsurgically reduce the periodontal pockets. Patient education is an essential component in the establishment of goals for dental patients, as many patients equate the absence of symptoms with the absence of pathology, and patients are unlikely to establish a goal to improve any aspect of their oral health unless they understand the nature and extent of the problem and the consequences of non-treatment. Dental patients who need feedback to become and stay motivated may have better outcomes with reward theory than goal theory because the praise (or lack thereof) from the dental professional provides a tangible and immediate assessment of at-home oral hygiene skills. Another way of examining motivation is by the avoidance or approach models. According to the avoidant model, a person is motivated to seek (approach) pleasurable or beneficial outcomes and avoid behaviors that would result in nonbeneficial outcomes . For example, a dental patient may be motivated to improve oral hygiene practices to avoid the cost and potential discomfort of restorations. Regardless of technique used, the basics of trust, compassion, and empathy critical to a successful relationship with the patient are also necessary in order for any motivational intervention to succeed. Patients must also have a desire to make the changes necessary for the goal(s) to be realized. Thus, motivation can be considered a process of communication and partnership between the patient and clinician, whereby the patient has a true desire for a positive change and the clinician provides the motivational support to do so. It is important to note that patient response will vary considerably and clinicians will not be successful with each motivational encounter, but this should not discourage them from trying. This course has focused on exploring a few of the behavioral issues that arise in dentistry, both among patients and among dental staff. Human behavior is a complex subject, and this discussion is just an introduction to how patients' behavior patterns can influence their ability to undergo dental treatment and how stress can affect dental professionals' ability to provide consistent and professional care. In today's society, stress is omnipresent, so it is essential to recognize and manage stressors before the ill effects of chronic stress develop. The more complex psychologic and behavioral issues of anorexia nervosa and bulimia nervosa were also reviewed, with particular attention to impact on oral health. Skills to motivate patients to maintain oral hygiene at home and to keep their dental appointments were also reviewed, as they are vital to ensuring that patients achieve ideal oral health. Motivation techniques usually have minimal inclusion in dental curricula, so their acquisition usually requires a commitment to post-graduate continuing education. Clinicians who understand behavioral issues that may be present in their patients or themselves will be better prepared to provide dental treatment that promotes ideal oral health for their patients while also maintaining their own physical, emotional, and psychologic health. 1. Kasschau RA. Understanding Psychology. Columbus, OH: McGraw-Hill; 2006. 2. WebMD. Easing Dental Fear in Adults. Available at http://www.webmd.com/oral-health/easing-dental-fear-adults. Last accessed October 25, 2016. 3. Locker D, Poulton R, Thomson WM. Psychological disorders and dental anxiety in a young adult population. Comm Dent Oral Epidemiol. 2001;29(6):456-463. 4. Armfield JM. Towards a better understanding of dental anxiety and fear: cognitions vs. experiences. Eur J Oral Sci. 2010;118(3):259-264. 5. Prochaska JO, DiClemente CC (1985). Common processes of self-change in smoking, weight control, and psychological distress. In: Shiffman S, Wills T (eds). Coping and Substance Abuse: A Conceptual Framework. New York, NY, Academic Press; 1985:345-363. 6. American Academy of Pediatric Dentistry. Guideline on Behavior Guidance for the Pediatric Dental Patient: Revised 2015. Available at http://www.aapd.org/media/Policies_Guidelines/G_BehavGuide.pdf. Last accessed October 25, 2016. 7. Milgrom P, Weinstein P, Getz T. Treating Fearful Dental Patients: A Patient Management Handbook. 2nd ed. Seattle, WA: University of Washington Continuing Dental Education; 1995. 8. University of Georgia: Department of Psychology. Diaphragmatic Breathing. Available at http://www.psychology.uga.edu/sites/default/files/CVs/Clinic_Diaphragmatic_Breathing.pdf. Last accessed October 25, 2016. 9. Mayo Clinic. Healthy Lifestyle, Stress Management: Types of Relaxation Techniques. Available at http://www.mayoclinic.org/healthy-lifestyle/stress-management/in-depth/relaxation-technique/art-20045368?pg=2. Last accessed October 25, 2016. 10. Boman UW, Carlsson V, Westin M, Hakeberg M. Psychological treatment of dental anxiety among adults: a systematic review.Eur J Oral Sci. 2013;121(3pt2):225-234. 11. World Health Organization. WHO Model Lists of Essential Medicines. Available at http://www.who.int/medicines/publications/essentialmedicines/en/. Last accessed October 25, 2016. 12. Stillwell DK, Anderson BJ. Adult minimal sedation in the general practice setting. Gen Dent. 2012;60(1):31-43. 13. LexiComp Online. Available at http://online.lexi.com. Last accessed October 25, 2016. 14. Little JW, Falace DA, Miller CS, et al. Dental Management of the Medically Compromised Patient. 8th ed. St. Louis, MO: Mosby Elsevier; 2012. 15. Elliot TJ. The hierarchical model of approach-avoidance motivation. Motiv Emot. 2006;30:111-116. 16. Morris AM, Katzman DK. The impact of the media on eating disorders in children and adolescents. Paediatr Child Health. 2003;8(5):287-289. 17. Romanos GE, Javed F, Romanos EB, Williams RC. Oro-facial manifestations in patients with eating disorders. Appetite. 2012;59(2):499-504. 18. Donaldson M, Goodchild JH. Maximum cumulative doses of sedation dedications for in-office use. Gen Dent. 2007;55(2):143-148. 19. Farinde A. Benzodiazepine Equivalency. Available at http://emedicine.medscape.com/article/2172250-overview?pa=62HeZWXGyjmRZfPF32FTmmg557jjaVkFkEQ70lXLvdOUtg7foqrhee9oiOkbczoiX3LG5dzWXJ98TptCUUk8EHf7Bj2Gvk6BKC47oRZ1BB8%3D. Last accessed October 25, 2016. 20. Singh P, Aulak DS, Mangat SS, Aulak MS. Systematic review: factors contributing to burnout in dentistry. Occup Med (Lond). 2016;66(1):27-31. 21. Alaujan AH, Alzahem AM. Stress among dentists. Gen Dent. 2004;52(5):428-432. 22. National Association of Anorexia Nervosa and Associated Disorders. Eating Disorder Statistics. Available at http://www.anad.org/get-information/about-eating-disorders/eating-disorders-statistics. Last accessed October 25, 2016. 23. Emmanouil DE, Quock RM. Advances in understanding the actions of nitrous oxide. Anesth Prog. 2007;54(1):9-18. 24. Branda EM, Ramza JT, Cahill FJ, Tseng LF, Quock RM. Role of brain dynorphin in nitrous oxide antinociception in mice. Pharmacol Biochem Behav. 2000;65(2):217-221. 25. Silverman M, Hexem J. Nitrous oxide/oxygen sedation and the single-dose sedative. Inside Dentistry. 2011;42-54. 26. Sanders RD, Weimann J, Maze M. Biologic effects of nitrous oxide: a mechanistic and toxicologic review. Anesthesiology. 2008;109(4):707-722. 27. American Dental Association. Guidelines for the Use of Sedation and General Anesthesia by Dentists. Available at http://www.ada.org/~/media/ADA/About%20the%20ADA/Files/anesthesia_use_guidelines.pdf?la=en. Last accessed October 25, 2016. 28. West DS. The eating disorders. In Goldman L, Schafer A (eds). Cecil Textbook of Medicine. 25th ed. Philadelphia, PA: Elsevier Health Sciences; 2015. 29. National Institute of Mental Health. Eating Disorders. Available at http://www.nimh.nih.gov/health/publications/eating-disorders/complete-index.shtml. Last accessed October 25, 2016. 30. Weinstein AR. Stress, disease, depression and dentistry: an integrative approach to health and wellness. J Mich Dent Assoc. 2005;87(4):26-28. 31. Little JW. Eating disorders: dental implications. Oral Surg Oral Med Oral Pathol Oral Radiol Endod. 2002;93(2);138-143. 32. Anderson L, Shaw J, McCargar L. Physiological effects of bulimia nervosa on the gastrointestinal tract. Can J Gastroenterol. 1997;11(5):451-459. 33. Humphrey LL, Fu R, Buckley DI, Freeman M, Helfand M. Periodontal disease and coronary heart disease incidence: a systematic review and meta-analysis. J Gen Intern Med. 2008;23(12):2079-2086. 34. Dentistry UK. Stress in Dentistry: A Study. Available at http://www.dentistry.co.uk/2012/02/02/stress-dentistry-study/. Last accessed October 25, 2016. 35. Freeman R. The psychology of dental patient care: strategies for motivating the non-compliant patient. Br Dent J. 1999;187:307-312. 36. RDH Magazine. Understanding How Motivation Achieves Patient Compliance. Available at http://www.rdhmag.com/articles/print/volume-26/issue-1/feature/understanding-how-motivation-achieves-patient-compliance.html. Last accessed October 26, 2016. 37. Franken R. Human Motivation. 6th ed. Pacific Grove, CA: Brooks/Cole Publishing; 2006. 38. Rada RE, Johnson-Leong C. Stress, burnout, anxiety and depression among dentists. J Am Dent Assoc. 2004;135(6):788-794. 39. Marieb EN, Hoehn K. Human Anatomy and Physiology. 9th ed. San Francisco, CA: Pearson Education, Inc.; 2012. 40. Diabetes.co.uk. Stress and Blood Glucose Levels. Available at http://www.diabetes.co.uk/stress-and-blood-glucose-levels.html. Last accessed October 25, 2016. 41. Miller DB, O'Callaghan JP. Neuroendocrine aspects of the response to stress. Metabolism. 2002;51(6B):5-10. 42. Padgett DA, Glaser R. How stress influences the immune response. Trends in Immunology. 2003;24(8):444-448. 1. American Academy of Pediatric Dentistry. Guideline on oral health care for the pregnant adolescent. Chicago, IL: American Academy of Pediatric Dentistry; 2012. Summary retrieved from National Guideline Clearinghouse at https://guideline.gov/summaries/summary/38458. Last accessed October 28, 2016.